A fully-equipped, gracious vacation home, villa Madreperla is elegant, spacious and features 6400 square feet with four bedrooms, six and a half bathrooms. 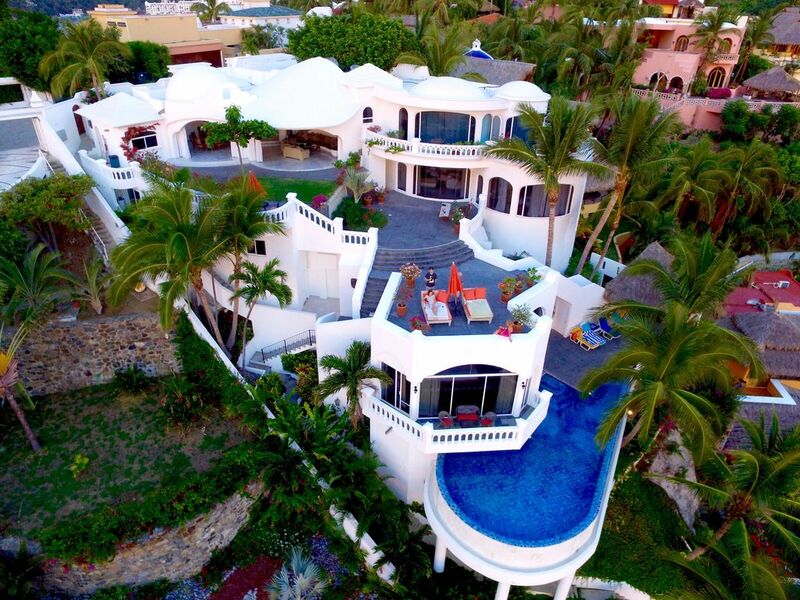 This luxury, oceanfront villa, overlooking the Pacific Ocean, is located in the most beautiful and exclusive gated residential community, La Punta, on Peninsula Santiago on the Mexican Riviera. It is just 35 minutes from the International Airport in Manzanillo - a Perfect Winter Get-away! Magnificent views and ocean sunsets from every room and every deck! Enjoy wonderful secluded private beaches and lighted tennis courts within walking distance. Amazing snorkeling, scuba diving, and fishing just from your property. Rental boating at adjacent Hotel Las Hadas. Las Hadas Resort Golf Course is ten minutes away. Three other golf courses are within 30 minutes. Two huge master bedroom suites each has a sitting area with writing desk, walk-in closet, terrace, king-size bed, one has jacuzzi. Two guest bedrooms with full bathrooms and walk-in closet. Beds include three kings and two full beds. Open living room and dining room. Dining table for ten. Family room. Five decks. Court yard with fountain and breakfast table. Secluded seaside large private palapa, 154 steps below house, just 15 feet from Pacific Ocean. Brand new infinity pool on the separate sun deck above the ocean. Separate maid quarter. Live in New York, spend winter in Manzanillo, Mexico. Winter hideaway. We like to be surrounded by happy people. Great service and beautiful weather year round, except rainy season in September and first half of October. Infinity pool on the separate deck above the Pacific ocean. Entrance from the villa and separate entrance from the master suite. La Punta pool at the beach. We spent a wonderful week at this special home. Booking and communication with the owner were terrific - and everyone was very helpful. As others have noted, the staff really makes this place special. The home is very well maintained, and the food was excellent. A few notes.... this house has a lot of steps, so if you are not prepared for a lot of climbing this is not the house for you. It is on multiple levels, each with steep staircases. Also, the pool is on the lowest level, and is often shaded, so if you plan to spend your days communing around the pool with a large group it is not ideal. We did snorkel off the rock beach at the bottom of the house, but I would only recommend it for strong swimmers. There is a nearby beach club that has a very nice sand beach. Like most of the houses in the area, this one seems to have been constructed and decorated in the 70's or 80's - and although it has not really been updated, it is in excellent condition and spotless. Otherwise, the views are magnificent, the bedrooms large and very comfy, and the open-air living room is wonderful. There is even a treadmill I also used every day. Also, for what you receive (big house, wonderful staff) - we felt this house was a particularly great deal. Thank you for your review of our house. It is very complimental. However, I have some correction to make: the house was finished in 2000. The community of La Punta had its start in the 80-th. We are now in the process of re-upholstering of the furniture in the dining and living open spaces. I hope it will look even nicer next season. It is hard to describe Madre Perla without talking about Henrique and the staff. What gracious individuals. All the meals were exceptional. Life is good when you start breakfast with a large platter of in season fruit. We had a wide age spread for our stay, 68 to 11. Very comfortable and clean. We paid for a car anddriver, which was a great choice. We all appreciated our time at Villa Madre. Madre Perla is a most amazing and relaxing vacation destination! It is equipped with everything you could possibly need and views from every deck that pictures cannot describe. If you have an opportunity to visit, do not think twice! Perfectly manicured gated community, excellent staff, close to town. Don't miss out! Our stay at Villa Madreperla was AMAZING to say the least - one of the best experiences of my life. The Villa is simply gorgeous; the view amazing; and the beauty is impeccable. The onsite staff (Enrique & Alejandra) were incredible hosts. From the moment Enrique picked us up at the airport until the moment he dropped us off they took excellent care of us. Alejandra's cooking was delicious - every single meal was new & fresh and Enrique is a true gem. It was fun yet relaxing and we enjoyed every minute of our stay - it was so far beyond our wildest expectations. Definitely a place I hope to return to again some day! They say a picture is worth a thousand words, but actually being there must be worth a million pictures. No photos can do this jewel of a place justice. The house, the view, and of course, the welcoming staff made our stay unforgettable. We will certainly be back, and staying at Madreperla will be on our minds around every opportunity to get away.